Domestic Battery: A case of battery involving family members. Family members include people related by blood or marriage, that share a home, that have or had a dating relationship, or that have a child in common. Domestic Battery is a Class A misdemeanor. The possible penalties are up to a year in jail and a fine of up to $2,500. Other possible penalties include “conditional discharge” or “probation”. Either of these will last for a specific time and include certain court orders. These orders may include community service, domestic violence counseling, and alcohol and/or drug counseling. Court Supervision is not an available option unless there is an agreement to reduce the charge to simple battery. Aggravated Domestic Battery is a Class 4 Felony. The possible penalties are up to three years in prison and a fine of up to $25, 000.00. There is a possibility of probation with court orders as outlined above. Supervision: There is no possibility of Court Supervision for Domestic Battery. 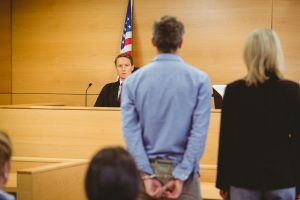 Unless the case is dismissed, the charge amended, or the person accused is found not guilty at a trial, a charge of Domestic Battery will result in a criminal conviction. A conviction means a criminal record with the arresting police, the Illinois State Police, and the Federal Bureau of Investigation (FBI). It means fingerprints and mug shots. State’s Right to Proceed: All documents in the case refer to “The People of the State of Illinois v. The Defendant”. The person who is the victim in the case does not have the power to decide whether the case should be prosecuted. That is the sole decision of the State’s Attorney. Bonding Information: After being arrested for Domestic Battery, release requires a bond be posted in either the form of a deposit for the entire amount of the bond (C bond), a deposit for 10% of the bond required (D bond), or a promise to pay a certain amount of money for failing to appear in court, sometimes known as personal or individual recognizance bond (I bond). A judge determines the conditions of release. Conditions of Bond: In a case of Domestic Battery, there are typically two special conditions of bond. The first is that the defendant have no contact with the alleged victim for 72 hours following release from custody. The second is that the defendant turn all firearms over to the police. Failure to comply with either of these conditions can result in separate charges and cause the defendant to be arrested again. Order of Protection: Often the alleged victim will request an Order of Protection related to the criminal charges. These orders are usually granted on an emergency basis, which are good for 21 days. After that there needs to be a hearing on whether the order will be extended and under what conditions. The defendant can be ordered to stay away from certain people and places, to turn over certain property, and to engage in specific conduct such as psychological or drug evaluations. It is important to have a lawyer to either contest an Order of Protection or to limit its effect. Motions: A Motion is a request by an attorney asking the judge to order that something be done. Some motions, if successful, such as Motion to Quash Arrest, Motion to Suppress Evidence, and Motion to Suppress Statement, can result in the case being dismissed. Experienced lawyers keep an eye on the case and the evidence to determine if there are important motions to be made that affect their client’s freedom.